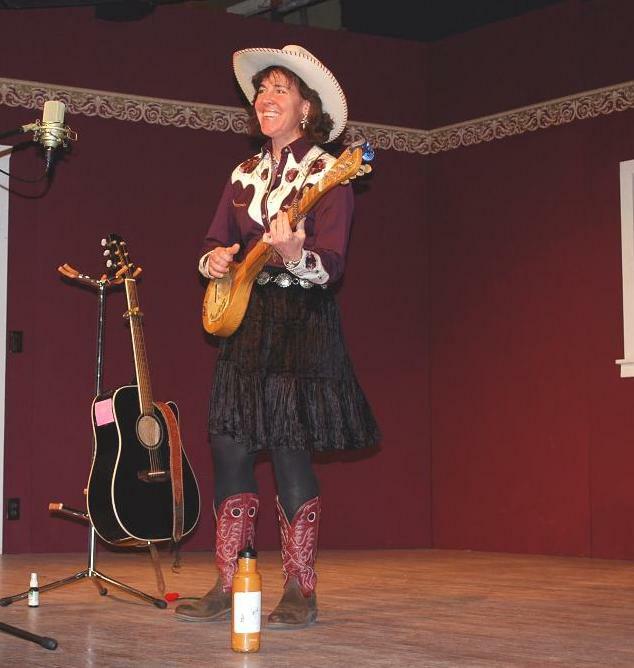 “V” The Gypsy Cowbelle entertained the audience this afternoon at Morgan Hall in Deming, NM in fine Cowbilly style! If you weren’t there…you should’ve been. “V” has written numerous songs that all have a story to tell either about her life on a secluded Wyoming ranch or about folks she has met along the way. She does a wonderful job introducing you to the people or putting you in the place she is singing about. She is a talented entertainer and we were lucky to have her in Deming. Thank you Deming Performing Arts Theater, for bringing her to town. And Thank You Miss “V” for the delightful show! I look forward to the next one! For more information about “V” The Gypsy Cowbelle, log on to www.gypsycowbelle.com. And buy a CD while you’re there! “The Itinerant Lady” is wonderful. You should have it in your library!